The first fever in a baby or an infant is often a scary moment for parents. Fortunately, most fevers are harmless and are caused by a mild infection or even over bundling a child. Regardless, you should report any fever in a newborn that is higher than 100.4 °F, taken rectally, to the child’s health care provider. Fever is an important part of the body’s defense against infection. Many older infants develop high fevers with even minor illnesses. 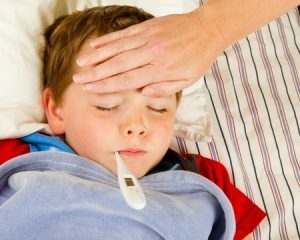 Treating your child’s fever Do NOT bundle up a child with blankets or extra clothes, even if your child has the chills. This may keep their fever from coming down, or make it higher. Acetaminophen (Tylenol) and ibuprofen (Advil, Motrin) help lower fever in children. Sometimes doctors advise you to use both types of medicine. Know how much your child weighs, then always check the instructions on the package. Take acetaminophen every 4 – 6 hours. Take ibuprofen every 6 – 8 hours. Do NOT use ibuprofen in children younger than 6 months old. Do NOT give aspirin to children unless your child’s doctor tells you to use it. A fever does not need to come all the way down to normal. Most children will feel better when the temperature drops by even one degree. A lukewarm bath or sponge bath may help cool a fever. It works better if the child also receives medicine — otherwise the temperature might bounce right back up.